Posted 4/16/2018 6:55pm by John Eisenstein. But enough of my wardrobe woes. You're doubtless wondering what has been going on here lately. The cold wet beginning of Spring has made it difficult to get things planted. Difficult, but not impossible! We will find a way! Even if it means pre- sprouting peas in my kitchen and planting them by hand. We've also planted carrots, radishes, green onions, beets, turnips, lettuce, cabbages, kohlrabi, and spinach. Presumably they will start to grow once it warms up and the sun comes out. 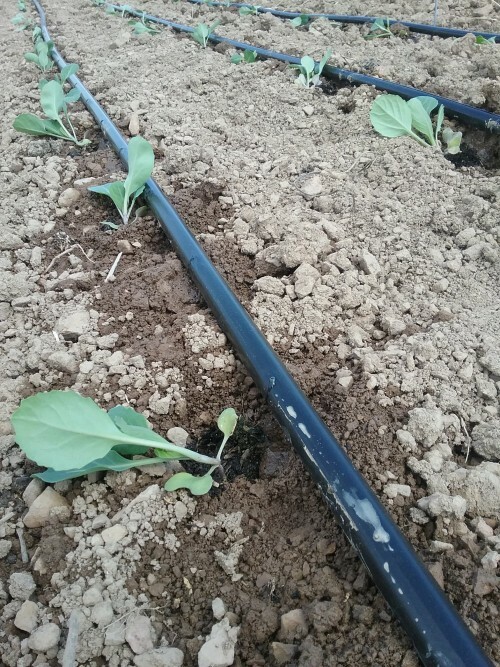 Here is a picture of some nice cabbage seedlings just planted. 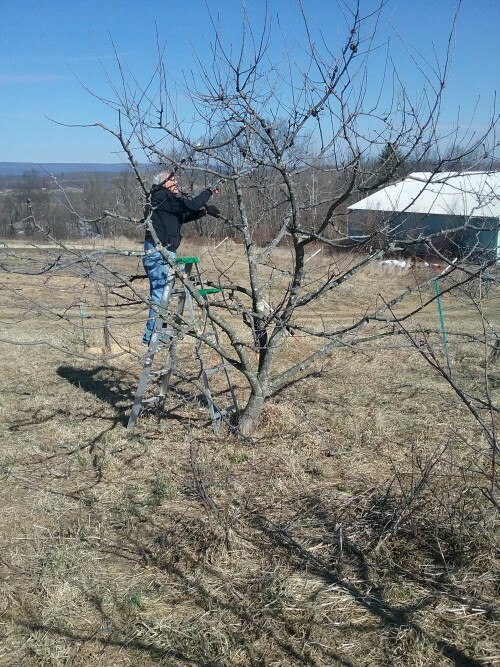 And here is my 78 year old father risking life and limb perched on a ladder pruning an apple tree toward the end of march. Dad lavishes the trees with care and attention, but organic tree fruit is never a sure bet, so keep your fingers and your cold, wet feet crossed! 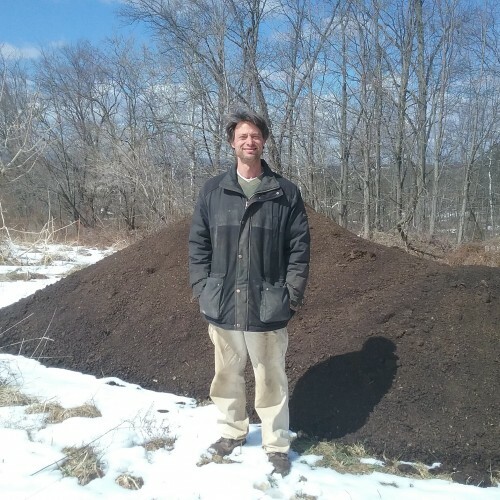 This handsome fellow standing in front of 17 tons of compost is myself. Applying compost and other organic soil amendments and otherwise preparing the fields for planting is a major activity this time of year. Finally, here is Queenie, licking off one of her newborn kids. 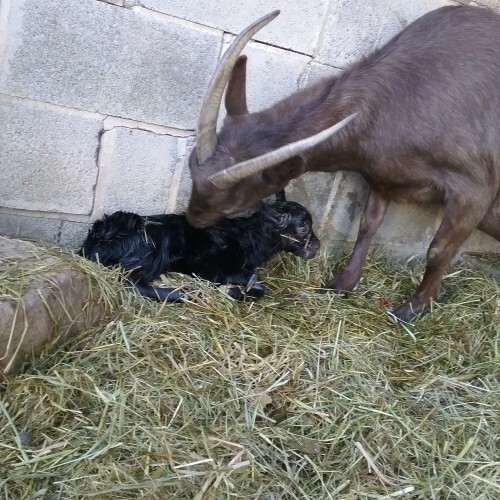 Queenie is a very attentive mother, but not a very nice goat in other respects. She's a spectacular milker, though, with huge volumes of rich creamy milk, which more than compensates for her personality failings. And besides, we all have our foibles, no? For anyone still planning or thinking about signing up for a CSA share this year-- we are filling up rapidly, so don't wait too long. You can click here to navigate directly to our signup page. As always, email me with any questions or just to say hi.